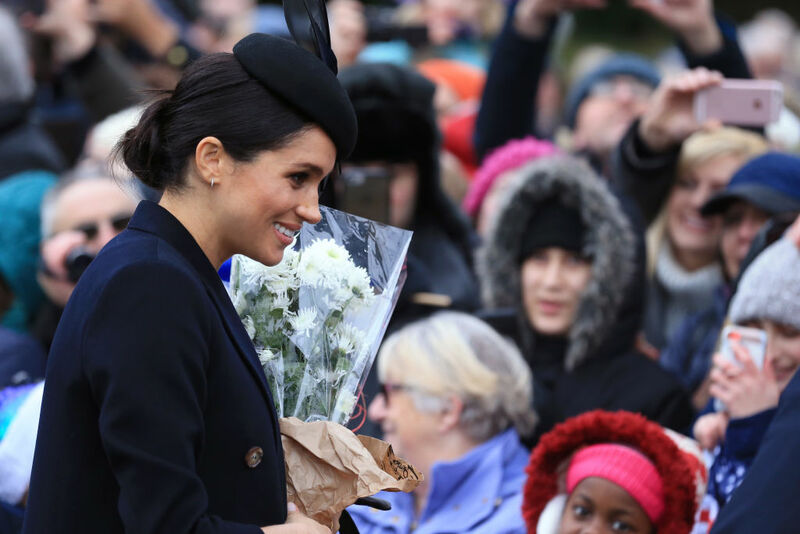 While the Duchess of Sussex continues to take heat from the British press, she remains steadfastly devoted to her truth, encouraging us to do the same. During those early months after her marriage to Prince Harry, the Duchess of Sussex seemed to represent a much-needed infusion of boldness and originality into the royal establishment (showcasing burgundy nail polish, bare legs, and flats, just a few ways she’s challenged tired traditions). But now she’s become the target of numerous unflattering reports, all stemming from repeated rumors that have cast her as a shrew lording over Prince Harry, a troublemaker instigating rifts with the Duchess of Cambridge, or a rogue force opting out of royal traditions (shooting pheasants or taking residence in Kensington Palace). Still, through it all, Markle evinces an authenticity that’s inspiring. She enlivens the Royal traditions with her own imprimatur — like when she brought a homemade banana bread to an official visit at the Australian Governor General’s Sydney residence, as Vanity Fair pointed out, or eschewed pantyhose while attending a performance of Hamilton in London. While we don’t have to face the considerable challenge of integrating into the British Royal Family the way Markle has, we can all relate to the difficulties of trying to stay true to ourselves under pressure. The Duchess of Sussex provides a refreshing reminder that even when the tide turns against you, maintaining the integrity of your truth is essential to your well-being. Thrive Global spoke with philosopher Mark D. White, Ph.D., the chair of the Department of Philosophy at the College of Staten Island/City University of New York, who writes a column for Psychology Today, and has probed questions related to the value of being oneself, to illuminate the three science-backed reasons it pays to honor your authenticity. “Being true to who you are is far easier and less stressful than trying to conform to others’ expectations and demands, which are ever-changing — and seldom rewarded in any meaningful sense,” White explains. Losing yourself in a constant scramble to be who others want you to be is also exhausting. In fact, studies indicate that those who score lower on authenticity scales express less life satisfaction and more distress. So the next time you’re urged to surrender yourself to someone else’s vision, take a minute to find your footing and assert your truth — the costs of not doing so are high. Constantly shifting to accommodate the ever changing whims of others will make you a stranger to yourself — and nothing breeds loneliness like feeling foreign in your own skin. “Being true to who you are helps you remember who you are — the person you’ve chosen to be, based on your own preferences and values — and leads to greater long-term satisfaction and self-comfort,” White says. A study from the University of Pennsylvania in 2014 demonstrated that being yourself correlates with your overall sense of well-being in the world, even when you set yourself apart from the crowd. Take inspiration from Markle’s clarity about who she is amid overwhelming pressures to conform. It’s a testament to her considerable character. If you’re forever morphing into different shapes to fit in, who can trust you or feel safe in your presence? How are you going to build healthy, sustainable friendships? As White puts it, “Being true to who you are helps you be better to other people, who can rely on you being the same person each time they engage with you, leading to better and longer-lasting relationships.” Sally A. Theran, Ph.D., a psychology professor at Wellesley University, gives credence to White’s claim. She spearheaded a study in 2010 showing that cultivating honesty and openness improves friendships and life satisfaction. That’s all the more reason to find your truth and share it with those you love. These are useful meditations to think on as we head into 2019, and continue to seek our truest and best selves.